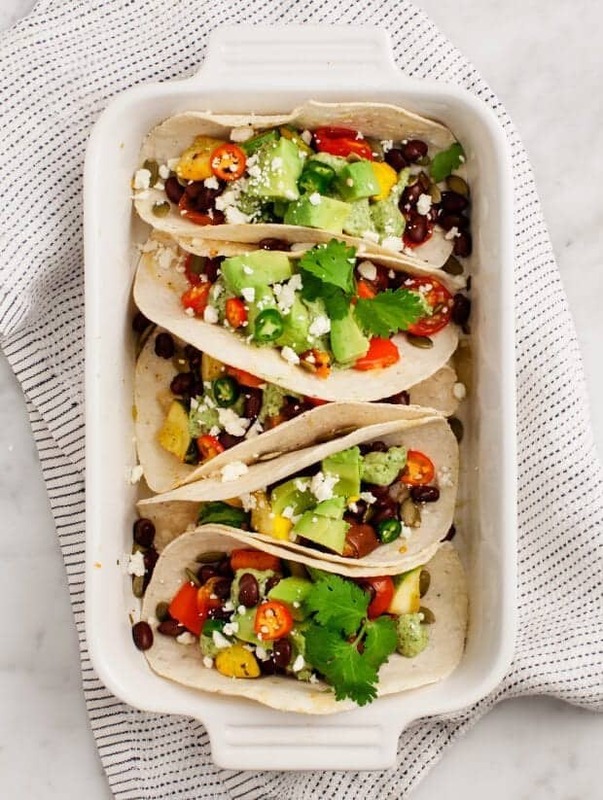 These easy vegetarian tacos are filled with black beans and roasted vegetables and topped with a delicious creamy avocado tomatillo sauce. I know – another taco recipe already? Well, I like tacos. I’m sure you do too because you are here after all. In all honesty, these were originally going to become enchiladas until I stopped short, which is why they’re in a baking pan. Plus, it was a convenient way to get floppy vegetarian tacos to stand up for the photo. The plan was to make something similar to this creamy poblano enchilada sauce, but using avocados, pepitas, spinach, and tomatillo salsa instead (see below, you can use store-bought salsa if you don’t have tomatillos). The end result? It’s like a tangy creamy pesto, and I couldn’t stop eating it straight from the food processor with a spoon. Because this sauce is so fresh and bright, I knew I’d wreck it if I tried to cook it. So taco night it was – with extra green sauce on the side. I roasted patty pan squash, eggplant, a red pepper, and cherry tomatoes, but anything goes here. You can roast whatever vegetables you have. If you’re craving fall foods, roasted sweet potatoes would be delicious. Along with the veggies, black beans, serrano slices, and a little cotija cheese fill these tacos. Skip the cheese if you’re vegan, as it’s not all that necessary. This taco recipe serves about two with lots of extra sauce. If you want to serve more, make the same amount of sauce and double the other components. Otherwise, save the leftover sauce, and eat it yourself the next day. Serve your vegetarian tacos with Spicy Margaritas or Watermelon Margaritas! 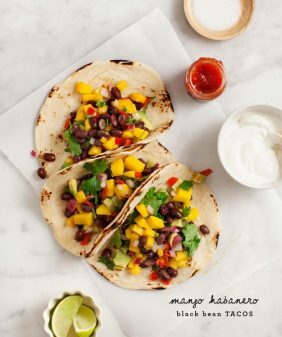 These easy vegetarian tacos are filled with black beans and roasted vegetables. 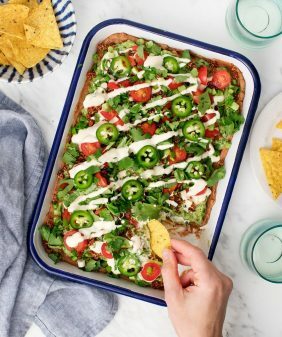 They're topped with an insanely delicious creamy avocado tomatillo sauce. Preheat the oven to 400° F and line a baking sheet with parchment paper. Place the chopped eggplant, squash, red pepper and tomatoes onto the baking sheet. Drizzle with olive oil and pinches of salt and pepper and roast until golden brown around the edges 25-30 minutes. Meanwhile, make your sauce. 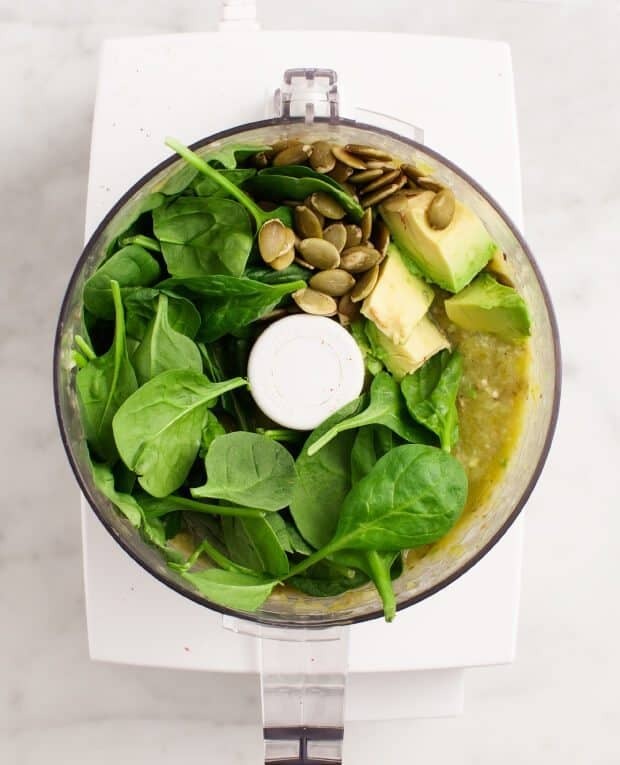 In a food processor, blend together the tomatillo salsa, pepitas, avocado, spinach, olive oil, lime juice and pinches of salt and pepper, to taste. Chill until ready to use. Assemble the tacos with the black beans, roasted vegetables, diced avocado, cilantro, serrano, cotija (if using), and a generous scoop of the avocado tomatillo sauce. Serve with extra sauce on the side. Store extra sauce in the fridge for 2 to 3 days. So much yummy colour. This looks great! I’m sold with your extra green sauce alone! 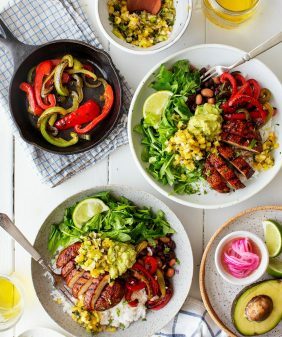 That Avocado-Tomatillo sauce looks absolutely delish! Your food photos are truely amazing. You should enter them into photo contests, you would totally win. 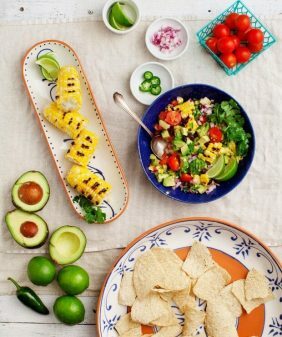 I love tacos and I love every blog post you put up but we have been in Asia for 5 months without a kitchen so I mostly skip looking at them because all i feel is jealously, unrealistic deep jealously! I made a taco recipe of yours before we left and it was devine. I can’t wait to get back to the states and have access to an oven! Thank you for all of your food inspiration! Wow these look absolutely divine! 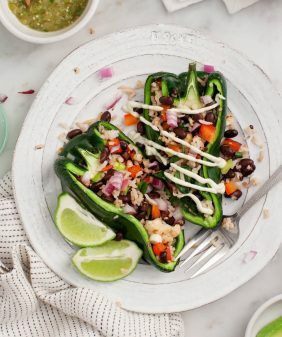 I love finding new veggie recipes, so I’ll definitely have to give these a try. I’m so glad I found this blog with full of amazing recipes. 🙂 after being pregnant two years in a row i became a bit bigger (hahaha) so now trying to find the best recipes that are good for me. Will definitely try this. Thank You! I just discovered tomatillos and I am IN LOVE! They are everything that you described: bright and fresh and delicious! I made them into salsa and had homemade pita chips alongside. So good! I was thinking of roasting them next time…your reticence to cook them for the enchiladas made me think twice about my idea. I am interested to see how roasting affects the flavor. I’ll let you know if it turns out good. Here’s to tomatillo love! 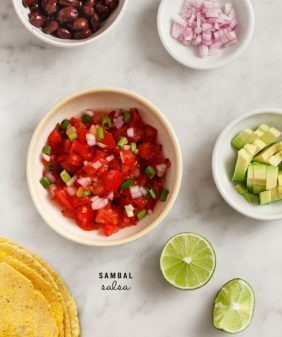 These tacos look so delicious – I’m yet to track down tomatillos but I am on the case! I loooove this. The sauce sounds delicious, I only had tomatillos once in my life, but I loved them. If only I could get them here, then this would surely materialize in my kitchen. I’m sure these would have been fantastic as enchiladas. But if they had been enchiladas I would have missed out on seeing all those beautiful vegetables because they would have been covered in sauce. Sufficient to say, there’s no such thing as too many tacos. These look FABULOUS! And, thank you for making notes on how to make them gluten free. While I’m not on a completely gluten free diet, I do try to avoid gluten when ever possible to help with some health issues. I can’t wait to try them. Thank you! We had this for dinner last night and loved this recipe! The sauce in particular – the avocado gives it a great creaminess without feeling heavy! What a colorful dish! So many delicious, healthy veggies! Awesome recipe! Excited to make these tonight, swapping out a few veggies for those we have on hand. Can’t wait to try the sauce – looks like a multi-purpose winner! Made this tonight and it was AMAZING. My husband wanted to dip all the veggies in the house in the tomatillo sauce. It tastes so yummy, there was no chance of leftovers for another day! I just ate these tnite. Didn’t even miss the meat! 5 stars. I enjoy visiting your blog. It reminds me of my own kitchen that’s why I like to visit. I’ve tried several recipes and we enjoyed them. So easy and the ingredients are not hard to find. After reading your recipe for tacos, I think we’ll try that one to. There are hundreds of taco recipes, but hey, I like tacos too. These look amazing. I was looking for vegetarian tacos for a birthday party with taco theme food. Do think I can do the roasting of the veggies the day before and then warm them in a crockpot? I’m sure I can make the sauce ahead of time. Think I’ll need to quadruple that recipe! Hi Debbie, you can roast the veggies ahead of time and reheat (although they will be more soft that way, but probably fine for tacos). You can make the sauce the day before!